CathyH: This was an awesome event! Now it belongs to the ages. The Museum of Flight wants YOU to design their next geocache, dedicated to the wonders of aerospace. They can help build it and cover $200 for parts. You get credit for a truly astonishing geocache design, Memberships to both the Museum and to Geocaching, a $50 gift certificate, and more! Details below. The Museum of Flight continues its collaboration with Geocaching Headquarters, kicking off an aerospace-themed geocache design challenge and a special appearance by private space explorer, Richard Garriott de Cayeux. He is also known as LordBritish in the geocaching world and has created several amazing caches. Last year, The Museum of Flight hid its first geocache: GC5GT6J, Spaceflight Academy. It's a very cool artifact scavenger hunt that ends in a physical cache built right into a museum exhibit. 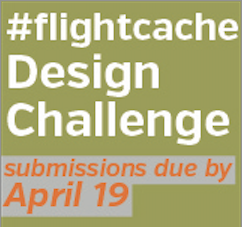 The FlightCache Design Challenge now seeks creative aerospace-themed designs for our next hide. Bring your "A" game. Design a cache that will earn many, many Favorite Points once created. One-to-two page entries are due April 19. 2015. Read the official rules and criteria. Submit your entries via email. You need not be present to win. Your goal is to WOW the judges. These include Museum staff, Geocaching Co-Founder and CEO Jeremy Irish, and LordBritish, who is America’s only second generation space traveler, video game designer, and the cacher who has hidden both the highest cache (GC1BE91, at the International Space Station) and the lowest cache (GCG822, at the Rainbow Hydrothermal Vents). Want ideas about being a great geocache maker? Our Maker Madness Pinterest board will get your creative juices flowing. The top three participants will each receive a VIP invitation and free admission to the Museum of Flight for the “Exploration and Hidden Treasures” event on May 16, 2015, an audience with LordBritish, and a Premium Membership to Geocaching for one year. Travel expenses are the responsibility of the participant. The winning design will receive one free annual membership to the Museum of Flight (reciprocal at many other museums! ), a $50 gift certificate to Shop Geocaching, an opportunity to consult with the Museum staff about their cache build and installation, and credit on the final geocache as “Owned by the Museum of Flight and [Winner’s Username]”. Mark your calendars now. Join LordBritish, Jeremy, and the contest finalists at the Museum for a special event on Exploration and Hidden Treasures. 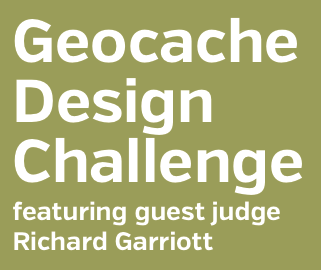 Be there as the challenge winner is announced to the geocaching community. If you haven't yet found the Spaceflight Academy geocache, this is an excellent time to do it. Not one but two space-flown travel bugs will also be at this event for discovery. Enter via the Museum's main lobby entrance. Look for the astronaut to sign the event log. Admission Fees: Adults $20; Seniors (65+) $17; Youth (5-17) $12; Children (4 and under) Free; Active Military $17. Erzrzore, gjb riragf va bar urer! 1: Ncevy 19gu qrnqyvar sbe #SyvtugPnpur Qrfvta Punyyratr. 2: Znl 16gu fcrpvny rirag ng gur Zhfrhz bs Syvtug jvgu YbeqOevgvfu.